Dan Kehn reviewed the La Spaziale S1 when it was first released back in April 2005. By all accounts the La Spaziale Vivaldi was a very successful machine with Chris' Coffee Service selling over 500 machines before introducing the Vivaldi II. With the recent additions of programmable preinfusion and programmable temperature offset differential, Dan and I thought it was time to update the buyer's guide with a fresh look at the La Spaziale Vivaldi II. This guide makes only one assumption about its readers—a love for espresso! Whether this is the first time you've considered making espresso in your home or you've been doing it for years, you will find tidbits of information in this guide to help your selection process. The new La Spaziale Vivaldi II much in common with its older sibling. 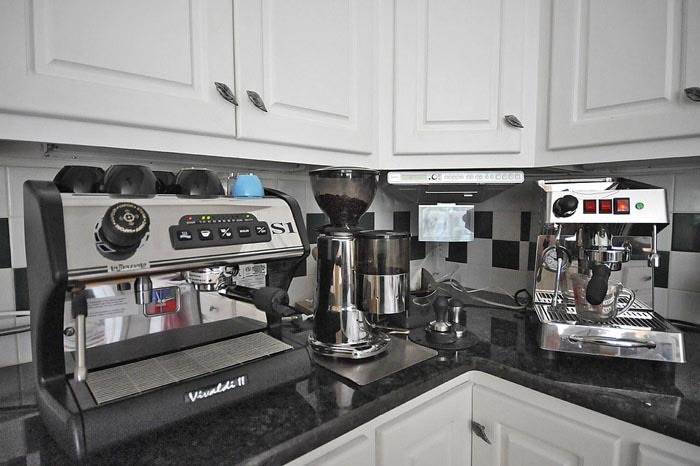 Both are double boiler espresso machines with a 2.5 liter steam boiler and a 450 ml group boiler. Double boiler home espresso machines have become more popular over the years with a handful of machines on the market today. Both machines are rotary plumbed for direct connect. There is a version of the La Spaziale called the Mini Vivaldi that sports a vibratory pump and tank rather than the rotary plumbing. The VII has now achieved ETL Sanitation and Electrical Certification for both the US and Canada. Chris Coffee has done a good job of keeping the upgrade path open for the VII. If you have an earlier version of the machine you can add programmable preinfusion or progressive preinfusion and programmable temperature offset differential features. We've picked a solid performer as a comparison espresso machine. La Valentine - one of Dan's favorite workhorses. La Valentina is a traditional heat exchanger with an E61 group. Its angled sides contribute to its sleek, compact profile is one of the narrower E61 heat exchanger espresso machines available. The progressive preinfusion inherent in the E61 design should make a good comparison to the programmable version on the VII. The model we used as calibration was converted to direct plumb-in. You can read Dan's review of this machine here. Commercial machines have been built with double boilers for decades, perhaps mostly notably by La Marzocco. Consumer product manufacturers have scaled these designs down for the home market. The VII was conceived for light commercial and home use. It has one 2.5-liter boiler dedicated to steaming and second 450-milliliter boiler dedicated to brewing. It also has other electronic convenience features that I'll cover in detail. The most obvious difference between the La Valentina and the VII is the double boiler. Inside we'll see a few more differences as it relates to the group design and temperature management. For a more detailed look at the differences between double boiler and HX machines check out the article on How I Stopped Worrying and Learned to Love HXs by Dan Kehn.